Cleanliness is half-health… We all are aware that “Health and Hygiene” always go hand-in-hand. As prevention is better than cure, being hygiene-freak is not a sin! Push out dirty and pull in purity! 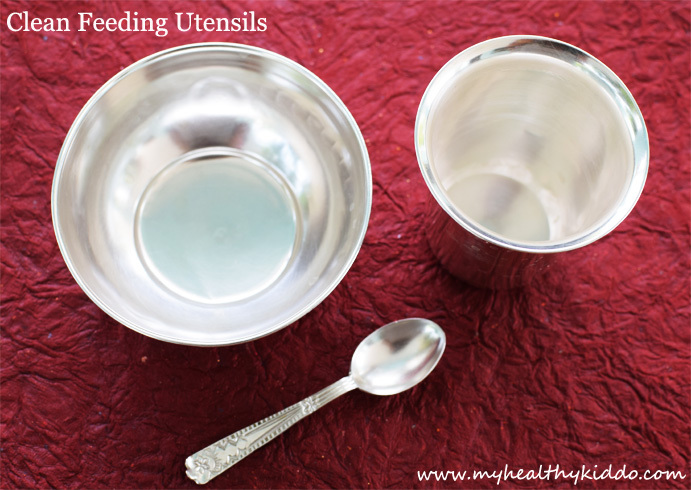 Sterilize baby feeding utensils atleast till the baby turns one year of age. we should be more cautious just for the more vulnerable tiny babies. First wash the dishes with baby bottle/bowl wash(liquid cleansers) or dish washing bar/liquid, then rinse it well with water. In a pan, drop the dishes and add water till it immerses well and bring water to a rolling boil. Then take out the hot dishes using tongs as depicted below.. Appearances are always deceptive ! 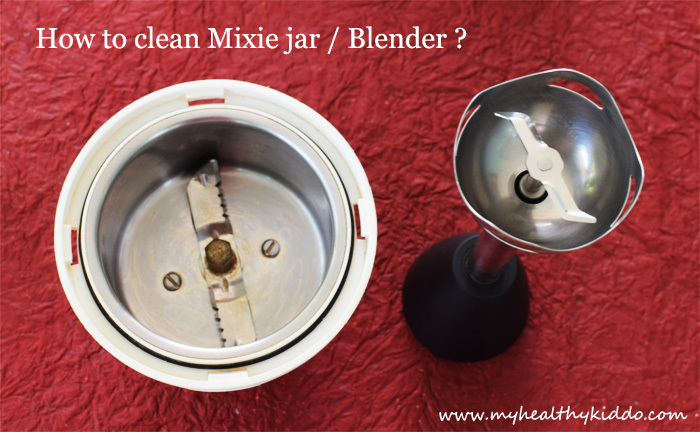 A cleanly washed mixie/blender seems to be so clean when you look at it. But, that is not true. Your pumpkin puree remnants might mix with tomato chutney , though not affecting the taste but imposing a risk to upset the tiny belly. It is necessary to clean the tiny particles accumulated inside the blade moulds. Do the below steps to unleash the underlying dirts! Pour some water in mixer. For blender, take a bowl of water. Open and you could witness the dirts settled under the blades. Drain that water and repeat this once or twice until you don’t see any visible residues. Rinse the mixer with clean water. Now, put the baby food to be blended and carry on. Before blending any food for babies, it is always advisable to clean in this method to get rid of unwanted particles sticking to the nooks of the mixer/blender. Though I have a separate jar for Nilaa, cleaning mixie in this way has become a habit for me and I do it involuntarily before and after blending any stuff. In my experience, Peanut butter, Nuts laddoo and coconut recipes demand more rotations than others.